Yesterday's wedding was AMAZING to say the least. First off, the bride, Kristi, and her mother Lynn were a pleasure to work with - from our first meeting at a local coffee shop, through the phone calls, emails, tweets and fb, to the sample consultation at my studio. I think we made a great team, and will miss all the fun we had together planning the details over the past year - what a fun journey it has been! Okay, before I get teary eyed again, on with the show! The bride's bouquet smelled as good as it looked. Fluffy white "Bowl of Cream" peonies, tender white sweet peas, white astilbe, David Austin "Patience" garden roses, and English ivy made up this dreamy composition. So very lovely, I miss it. Sometimes I get attached to certain pieces I create, this was definitely one of them. Kristi has developed a passion for peonies, so I know it went to a good home - hee hee hee ; ) . Just a small detail I like to do when the bouquets are varied. My handwriting has not improved much since the fourth grade, but still a nice touch - right? An array of pink blooms made up the attendant's bouquets. The maid of honor's bouquet is performing circus tricks on one of my vintage cake plates. The mother of the bride and groom opted to carry small posies of Attache' roses and pale pink sweet peas. The boutonnieres were tailored bundles of stephanotis, astilbe, and fresh lavender from my garden. After much debate over whether to have the ceremony inside or out, the sun came out just in time to save the day! The breathtaking setting at the Otesaga Resort is unparalleled by any other venue in upstate New York. It is worth the trip up here!!! The serene lake surrounded by the lush rolling hills made my job very easy. The urns allowed an unobstructed view, and served as a focal point for the ceremony. I think a heavily decorated arch would have competed with the natural grandeur - great choice Kristi!!! Hanging vases lined the aisle filled with colorful pink flowers. I love doing these little arrangements! The place cards were hung from my old windows. They were adorned by a garden style arrangement that had trailing ivy "growing around the window." I love the vintage books, but will have to get back to some other details in Part II. The porch was decorated and waiting for the guests to come sit and enjoy the wonderful cocktail hour. Beautiful candlelight and rose petals, simple and perfect. The window bays were decorated with hurricane lamps, greens, and flowers repurposed from the ceremony. There were two different style of centerpieces. The first were designed in silver Revere bowls. They were inspired by the illustrations of Tasha Tudor - who always made me feel completely enchanted since early childhood. The second style surrounded glistening mercury glass votive holders, and highlighted individual flowers used throughout the wedding decor. The sweetheart table waiting for Kristi's bouquet to take center stage. An enchanted and savage garden growing upon the mantle - one of my favorite creations to date. There's that ivy again , creeping it's way up the vintage luggage rack to the suitcase that served as a card holder. So much better than a birdcage - especially if you are not fond of the sweet feathery creatures - you know who you are : ) . I will leave you with this picture of this delicious looking cake by Marjorie Landers. I am so happy I had the chance to meet her and chat a bit, she is just as sweet as her confections. It was also a pleasure to meet Professional Disc Jockey Jeffrey Scott. I hope to be a guest at one of his weddings soon. Congratulations Kristi and R !!!! You are such a lovely couple. We wish you a life time of love and happiness !!! ...I think we just got one step closer!!! It has been a fun week (and year) and a long day getting ready for this fabulous wedding at the Otesaga Resort in Cooperstown. Everything turned out perfect, but I am too tired to make a full post. Just had to tease you with a quick sneak peak of Kristi Gustafson and R's wedding flowers. Check back tomorrow for a full floral display. at the Glemere Mansion in Chester, New York. The bridal bouquet in all its glory. Shirley temple peonies, Juliet roses, and pale pink sweet peas make up the drool worthy composition. Carmen requested that I dye the lace to become her "Something Blue." I just love the contrast against the pale peach satin ribbon. The bridesmaids carried white hydrangea, Juliet roses, sweet peas, hypericum berry, and accents of dusty miller. The stems were covered in peach satin ribbon with a glittery sheer overlay. A splendid array of corsages and boutonnieres. 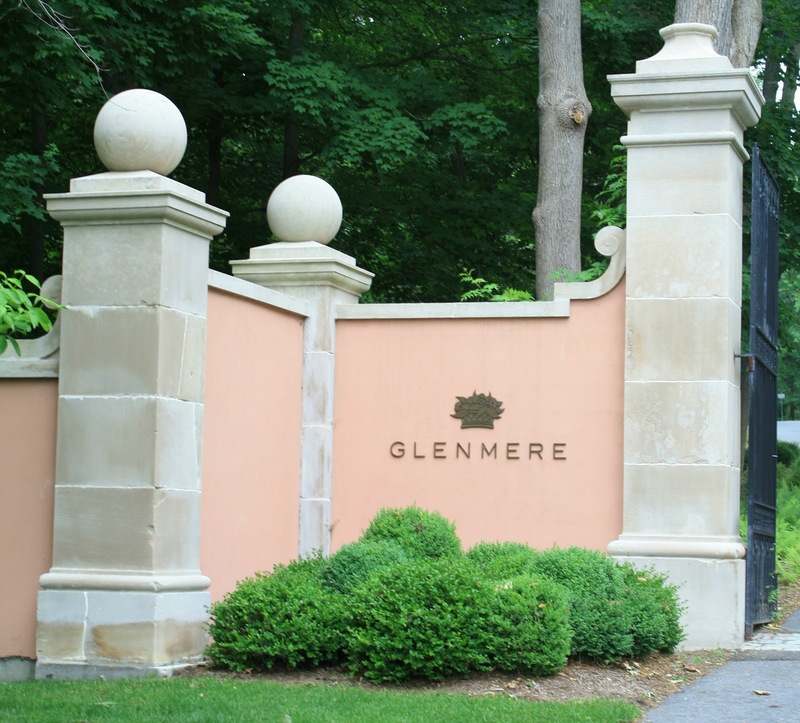 Glenmere is a spectacular mansion situated in the Hudson Valley. Recently, the mansion has become available to rent for exclusive events and weddings. The newest space being offered is The Meadow - a majestic lawn with amazing views of rolling hills which surround this unforgettable venue. Lanterns adorned with garden roses and vases filled with romantic flowers decorated the farm tables that would later be home to a dessert buffet. The tables were arranged into long family style configurations. I LOVED this set up. The seemingly endless sea of cobalt drinking glasses and navy blue chivari chairs were PERFECT ! The lush and aromatic centerpieces included peonies, sweet peas, stock, garden roses, frosty pink astilbe, and lavender from my garden. 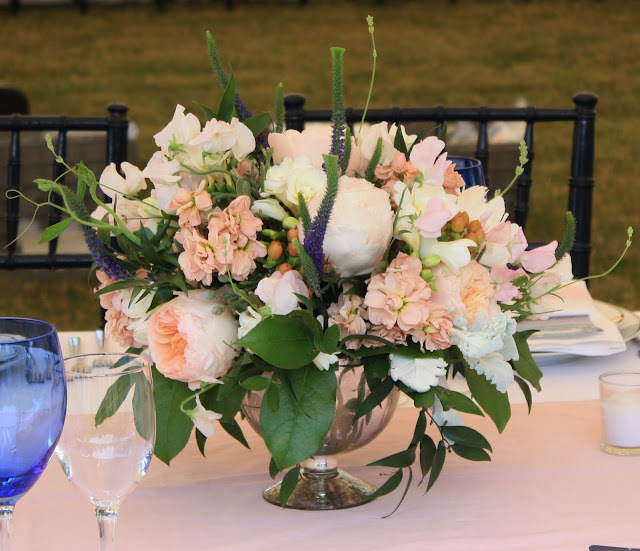 The bride and grooms chairs were decorated with garden roses, peonies, and clematis vine. Looking forward to sharing some nighttime pictures of Stortz Lighting's handy work in the near future. 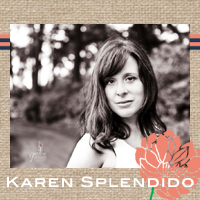 Carmen and Darren hired Katie Berger of Sara Kate Events to execute and oversee the fine details of their day. She was a pleasure to work with! A good wedding planner is a great investment, it really frees up your friends and family to enjoy the celebration. The guest book table held loose and painterly blooms accented by a moss runner. The path leaving the tent, so beautiful, I had to include another picture. Congratulations Carmen and Darren, I wish you many years filled with happiness and love!!! !